Plans are underway for the 2016 Gandhi-King Conference. 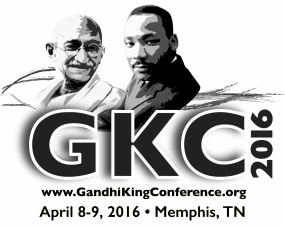 This year’s Gandhi-King conference will be held April 8-9, 2016 at the University of Memphis campus. This two day event brings together modern visionaries on nonviolence, justice and social change with community leaders, activists, academics, and organizers to train, learn, plan, and organize to shape a just future for all. Presentations and workshops should address racial, economic, environmental, and gender equality as they relate to historical and contemporary movements. This year’s theme, A Living Movement: Shaping a Just Future, should encourage an exploration of both the theoretical and practical applications of nonviolence to challenges facing our communities today. Proposals are sought that address various levels, from the local to the global, academic to activist, economic justice to environmental justice. The deadline for proposal submission is February 1, 2016. More information is available at http://www.gandhikingconference.org/.